Is an account of my journey from illness to health through natural medicine. After struggling with the symptoms of psoriasis for years, I have developed many holistic strategies that have led my body back into it’s innate, healthful balance. In my book I lay out all of the tools and strategies that helped me find my way back to wellness, including herbs, supplements, essential oils, flower essences, empowerment techniques, and affirmations. I AM WRITING TODAY BECAUSE I have to. This information must be shared. This life, this precious life, is in our hands, literally. We each have the ability to help create the life we want. The challenges that come up for us, the difficulties and hardships, can show us what is going on within our bodies and turn out to be gifts that have a beautiful treasure for us. They can awaken our souls to our life’s joys and our highest potential. For me, my skin has always been my messenger, guiding me toward empowerment. From age nineteen to age forty-two, I had psoriasis on my body—thick, red patches that launched me on an epic health journey. Then the psoriasis disappeared. Our very intelligent bodies are reflections of what is going on within us. We are incredible maps on which our emotions, ailments and challenges are shown as a guide to our inner world. They guide us into ourselves, giving us information and a reflection of that which is trying to get our attention. The same is true of our skin. Psoriasis showed me my inner hardships and helped me look at the shadows that had not been addressed or brought to awareness. These shadows were my hidden emotions and fears, and the part of me that was craving attention and love. My journey to heal psoriasis was not an easy one. I struggled and resisted and did not want to face that this was my reality. I secluded myself from the world and did not want to change my ways. Then I started to see an opportunity for relief and healing. One step at a time, I experimented with different foods, supplements, lifestyle changes, and different practices to help me feel good, love myself, feel my emotions, and eventually tap into a larger part of myself—my spirit. I began to see that I was going to be okay, and—more so—that clear skin was possible. Psoriasis: Free and Clear is not only about psoriasis and the steps you can take to help clear your skin but also about the massive potential that we have as humans to transform our lives. It is about how to thrive through excellent nutrition and connection to the spirit within. If you have psoriasis, this book can change your whole viewpoint of this disease and why it is in your life. It will offer you tangible tools and tips to help heal your body. I wrote this book because I discovered that you could help create your reality based upon your beliefs and what you choose to focus on. By directing your energy and focus consistently and deliberately to positive feelings, peace, ease, and things that make you feel good, you begin to emanate a certain state that attracts more of the same. Bringing these feelings into your daily experience regularly is helpful in attracting more experiences that match those feelings. Then, you can more easily return to this state again because your body has a certain intelligence and remembrance of this experience. At the same time, we have emotions of anger, sadness, frustration, and fear. By not avoiding and resisting these emotions, by instead allowing them and loving yourself through them, you feel profound self-acceptance. This self-approval also creates a field of energy that is soft and loving, in which a deep healing can take place. Loving myself in the face of all of these emotions was—and still is—a practice and tool that I have developed and continue to develop each day. This practice can create great healing and can help you in clearing your skin. I offer my story and twenty-three years of self-experimenting, research, lifestyle adaptations, and guidelines. My intention is to expedite your healing process, help you find peace with your situation, and offer you inspiration in your daily life. I did it, even though there were many times I didn’t think I could. I invite you to read this book with an open heart. Know that you were drawn here for a reason, and that I am offering you a perspective on skin challenges that can help you find peace where you are and maybe even heal your skin. I wish someone had told me back then, when I discovered that I had psoriasis that there was another way besides settling into having it for life. After healing myself, I am here to say that there is hope; there is a possibility for you to experience a breakthrough in your life. Your journey will be unique to you and—while I am not claiming a cure for psoriasis—I can share with you what worked for me. The first chapter discusses the definition and causes of psoriasis. I've got a great book for you guys about using food and your positive energy to heal your skin issues! 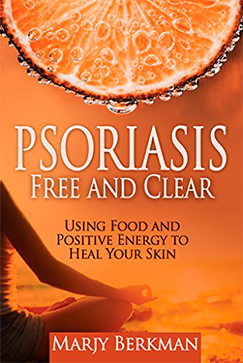 The book is called Psoriasis Free and Clear by Marjy Berkman. The focus is on her journey with this skin issue and how she took steps to heal herself.